Florence Juvet DVM, DipECVIM-CA, MRCVS. Florence qualified from the University of Lyon, France in 2002. This was followed by an internship in Lyon and several years in small animal practice in the UK and abroad. Florence completed a 3-year residency at University College, Dublin in 2009. She achieved the European Diploma in Small Animal Internal Medicine in 2010 and is a European Specialist in Small Animal Internal Medicine. 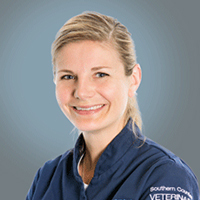 Florence has a wide interest in all aspects of small animal medicine, particularly endoscopy, gastrointestinal disease, urinary tract disorders, endocrinology and infectious diseases. Kelly, D., Craig, A., Juvet, F. (2018) Idiopathic splenomegaly: a previously unrecognised cause of anaemia and thrombocytopenia in a dog. Veterinary Record Case Reports.